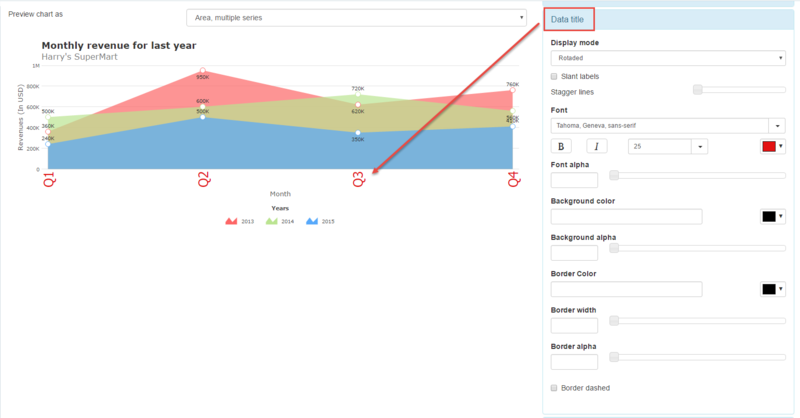 In this area you can customize the chart themes, you will be able to preview how it will look like according to each chart type. Activate this function to add a border around the chart area. Border use : Not informed, use or do not use. Not informed: This option will use the default option of the theme. Use : Select the border as active, you will need to set the width. Do not use : to remove or do not use the border. Color : Select the border color, and may report a hexadecimal value or select using the color picker. Width : Sets the border width in pixels. Opacity: Sets the border transparency. Options to configure the background color of the chart. Color : Select the background color, and may report a hexadecimal value or select using the color picker. New color : Adds a new color for the background. Opacity : Select background transparency. Options to configure the chart canvas. Background color : Selects the color of the canvas, and may report a value hexadecimal or choose picker. New color : Adds a new color option. Background alpha : Selects the background transparency. Use : Selects the border as active, you will need to set the width. Do not use : To remove or to do not use the border. Color : Selects the canvas color, and may report a hexadecimal value or select using the color picker. Opacity: Sets the canvas transparency. Options to configure the formatting of the title. Title font : Selects the font, size, color, and formatting of the title. Subtitle font : Selects the font, size, color and format of the subtitle to left, center or right. Alignment : Selects the position of the title and subtitle. Show on top : If this option is selected the title and the subtitle will be positioned above the chart, otherwise will be positioned below. Font : Selects the font, size, color, and formatting of the axis. Background color : Selects the background color, and may report a hexadecimal value or select using the color picker. Background alpha : Selects the transparency of the background color of the axis. Border Color : Selects the color, and may report a hexadecimal value or select using the color picker. Border width : Sets the width in pixels. Border alpha: Sets the transparency. Border dashed: If this option is selected, the border is dashed, this option is only valid if the option “Display” is checked. Options to set the chart’s data (bank records). Use gradient : Enables the data gradient. Gradient color : Selects the gradient color, and may add a hexadecimal value or select using the color picker. Gradient angle : Selects the angle of the gradient. Gradient alpha : Selects the gradient transparency. Show border : If this option is selected is activated the border in the data. Border dashed : If this option is selected, the border is dashed, this option is only valid if the option “Display” is checked. Use rounded border : This option leaves the rounded border. Options to choose the colors of each chart palette. Colors palette : Select the color of each chart palette. Options to configure title formatting of data. Display mode : Selects the display mode to “automatic”, “rotated”, “line break”, “in levels” and “None”, if the Automatic option is selected, select the default option. Slant labels : Selects the number of levels to the data. Font : Selects the font, and your formatting such as bold, italic, size and color of data. Font alpha : Selects the transparency of data title font. Background color : Select the background color, and may add a hexadecimal value or select using the color picker. 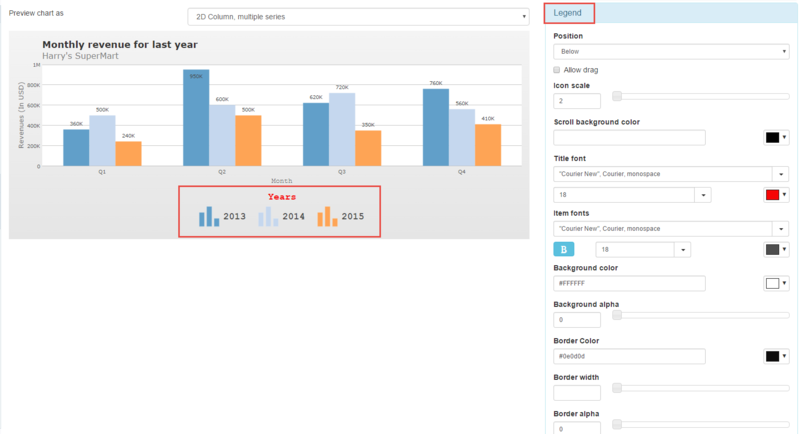 Background alpha : Selects the transparency of the background color of the title of data. Options to configure the formatting of data values. Font : Selects the font, and your formatting such as bold, italic, size and color of the data values. Font alpha : Select the transparency of the source of the data values. Border Color : Selects the border color for the data values. Border width : Selects the border width for the data values. Border alpha : Selects the transparency of the color of the border of the data values. Options to configure the Division of horizontal and vertical lines on the graph. Amount of horizontal lines : Selects the amount of horizontal lines that will be shown in the chart. Horizontal line color : Selects the horizontal line color. Horizontal line thickness : Selects the thicker horizontal line. Horizontal line dashed	: If this option is selected will horizontal line plot. Color horizontal stripes : If this option is selected you can choose the horizontal line color. Horizontal stripes color : Selects the color you wish to case “Coloring horizontal Ribbon” is checked. Horizontal stripes alpha : Selects transparency horizontal ribbon. Vertical line color : Selects the color of the vertical line. Vertical line thickness : Selects the vertical line thicker. Vertical line alpha : Select the transparency of the vertical track. Vertical line dashed	: If this option is selected will draw the vertical line. Color vertical stripes : If this option is selected the developer can choose the color of the vertical line. Vertical stripes color : Selects the color you wish to case “Color vertical stripes” is checked. Vertical stripes alpha : Select the transparency of the vertical stripes. Options to configure anchors on the chart. Show anchors : Enables the anchors in the chart. Anchor sides : Select the width of the anchor. Anchor radius : Selects the size of anchor beam. Background color : Select the color, and may add a hexadecimal value or select using the color picker. Background alpha : Selects the transparency of the anchor. Border Color : Select the anchors border color, and may add a hexadecimal value or select using the color picker. Border width : Select the border width of the anchor. Options to configure the tooltips in the chart. Background color : Select the tooltip color, and may add a hexadecimal value or select using the color picker. Background alpha : Select the transparency of the background of the tooltip. Border Color : Select the tooltip border color, and may add a hexadecimal value or select using the color picker.. Shadow : Enable the shadow in the tooltip. 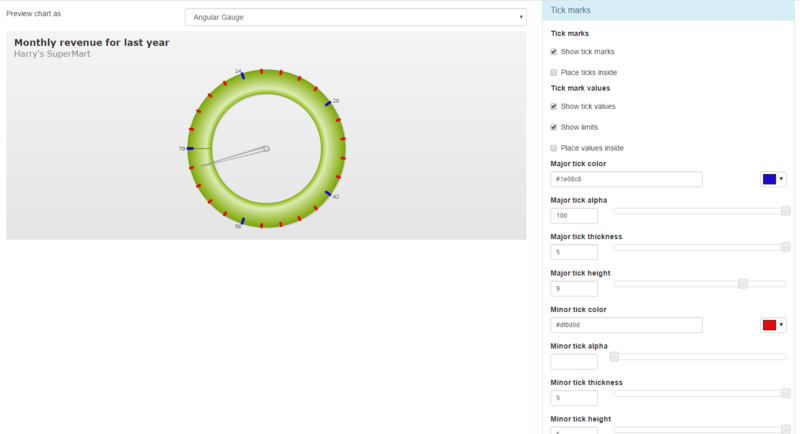 Option to the configure chart marks, this option is only possible for the “Gauge” charts. Show tick marks : Enables the tick marks on the chart. Place ticks inside : If this option is checked the marks of the chart will tile chart poker. Show limits : If this option is selected will show the chart limits. Major tick color : Major tick color. Major tick thickness : Major tick thickness. Major tick height : Select a height for the major tick. Minor tick thickness : Minor tick thickness. Minor tick height : Select a height for the minor tick. Options to configure the chart legend. Position : Selects the position of the legend, “beside” or “Below”..
Beside : Positions the legend beside the chart. Below : Positions the legend below the chart. Allow drag : If this option is selected it will be possible to drag the chart legend to the desired position. Scroll background color : Selects the color of the scroll bar. Title font	: Select the font, and your formatting such as bold, italic, size and color of the legend. Background color : Selects the background color of the legend. Background alpha : Selects the transparency of the legend. Border Color : Select the legend border color, and may add a hexadecimal value or select using the color picker..
Border width : Selects the Border width of the legend. Border alpha : Selects the border transparency of the legend.